Since 2012, people have hit the roads of Berkeley for the annual Sunday Streets, a 24-block-long community event. Presented by the Downtown Berkeley Association, North Shattuck Association, Telegraph Business Improvement District and Walk Oakland Bike Oakland, the event took over parts of Shattuck Avenue, Durant Avenue and Telegraph Avenue. The streets were closed to automobiles, allowing people — and their pets — to peruse the different booths, almost all of which were for local musicians and vendors. 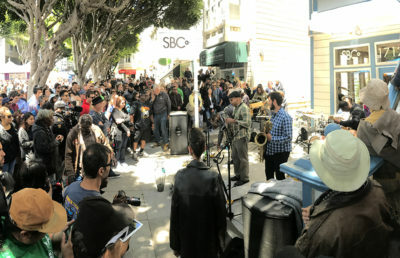 “It’s just a bunch of organizations getting together to reclaim the streets for pedestrians and inviting merchants in the community to come out, be on the streets and not have cars for a little while,” said Matthew Jervis, marketing director for the Downtown Berkeley Association. Situated on Shattuck Avenue, Afrose Fatima Ahmed welcomed passers-by to “ask me for a poem.” People lined up to receive poems Ahmed conjured up on the spot and printed with her Corona typewriter — a task she referred to as her full-time job. She accepted money in a small glass jar originally intended for chia porridge. Because of the sheer number of vendors who signed up to participate in this year’s street festival, the event extended to Durant Avenue and Telegraph Avenue for the first time, according to the event’s Facebook page. 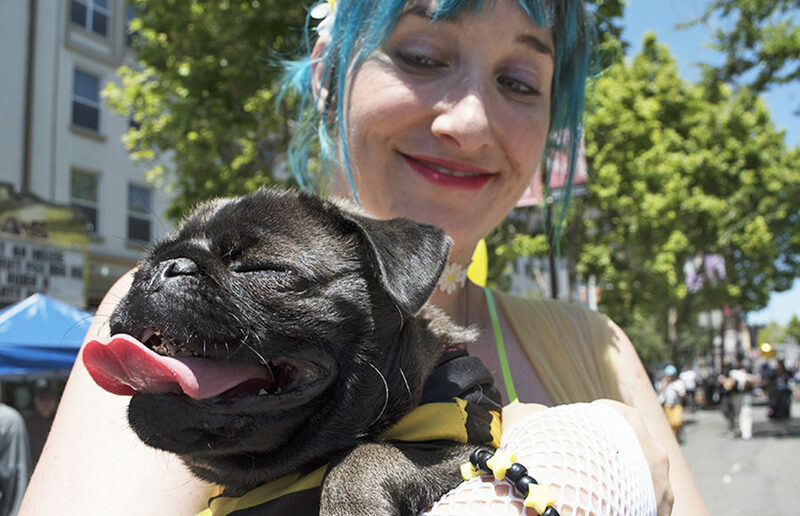 Another festival first was the downtown Pet Parade, during which people watched dogs and their owners march by in different costumes — capes, fake manes, Hawaiian shirts and more. Best dressed awards were distributed to pets and owners alike. 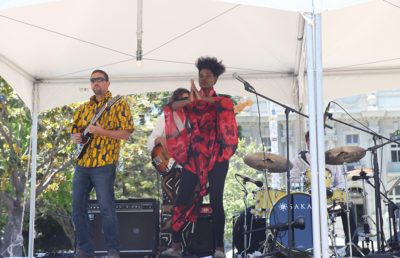 The festival’s celebration of art was not limited to its visuals, as this year also marked the first time Sunday Streets teamed up with Berkeley World Music Festival, according to Ajura Smith, one of those manning a festival information booth. Sonia Pina, musical director at Batalá San Francisco, led the samba reggae drummer group during a performance in front of Sweetgreen, each member clad in red and black. Swaying and beating in time upon drums that reached their individual waists, their synchronization matched Pina’s rhythmic movements as she swayed in front of the group to the beat. The group was slated to participate in last year’s Sunday Streets Berkeley, but the Northern California fires resulted in the festival’s cancellation. Inside Cornerstone Craft Beer & Live Music, another musical act was taking place, though with members much younger. 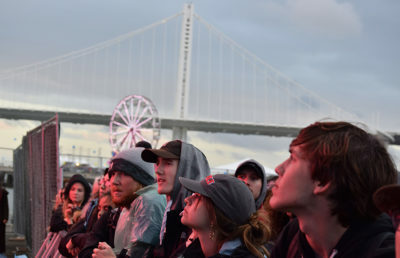 While the venue has hosted acts ranging from Best Coast to Caleborate and features a full-service bar, its presence was decidedly focused upon community members far younger than 21. While their pianist left soon after their performance, remaining band members Jackson Pine, Dylan Heinstein, Charlie Cappel and Brandon Coleman shared that they are all only 14 years old. The band, originally named AM-PM Mini Mart, practices together every week with BandWorks, a year-round music lesson program started by co-founders Steve Gibson and Jeremy Steinkoler. Each of the bands within the program chooses what songs they want to play, according to Gibson, who added that there was a period of time when everyone wanted to play Green Day songs. With a laugh, he recalled one band that played a Taylor Swift song and a Metallica song in the same performance. “I’m proud to be able to contribute to the culture of the city … with so many people able to experience the joy of music through our program,” he said. Scheduling for the event has been inconsistent over the years. The festival’s 2017 cancellation was only one instance — in 2016, the festival was rescheduled due to weather concerns and, according to Jervis, the festival may come back for a second time this year in October. Yet this inconsistency might be Berkeley’s own laid-back style, even down to the buttons, which Jervis said hark back to Berkeley’s hippie years of the ‘60s and ‘70s. But Smith focuses more on today and what’s to come for the city. Alyssa Bernardino covers city government. Contact her at [email protected] and follow her on Twitter at @alybernardino. Caroline Smith is the arts editor. Contact her at [email protected].